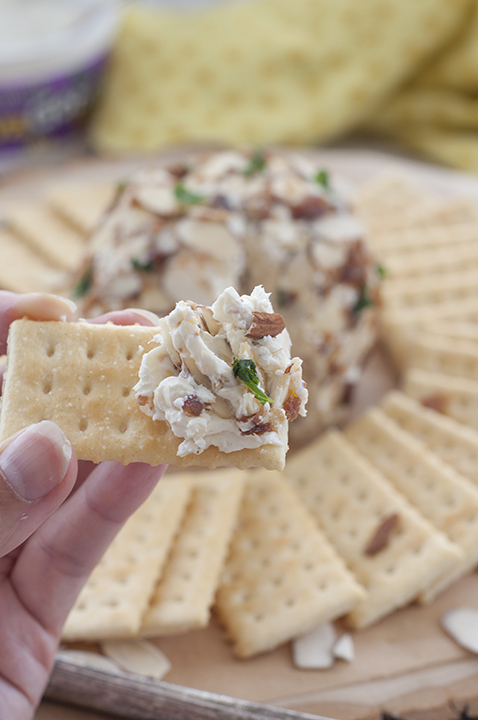 Creamy Buttermilk Ranch Bacon Cheese Ball loaded with cheese, bacon and coated with sliced almonds – a quick and easy appetizer recipe for any occasion (game day, holidays) & ready in 10 minutes or less! 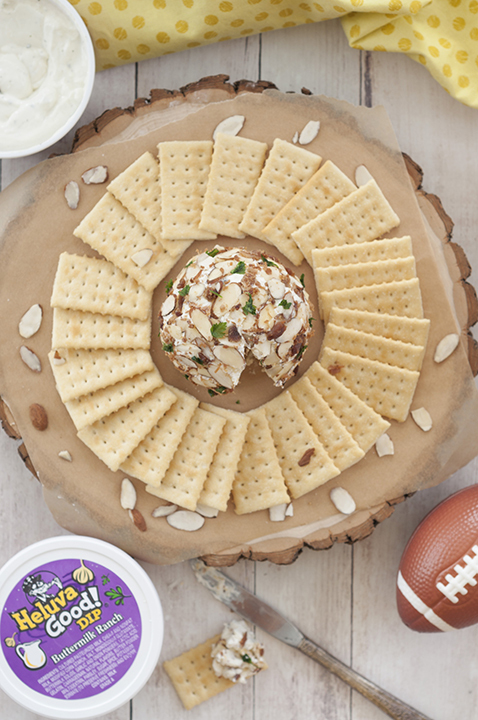 Everyone loves a good cheese ball, am I right?! There are so many marvelous appetizers only made possible thanks to the presence of cheese, bacon, and dips. A world without any one of those things is a world I don’t want to live in. A world without this Buttermilk Ranch Bacon Cheese Ball is world I REALLY don’t want to live in. We always had the classic cream cheese-based cheese ball on holidays in our family and it was always that familiar appetizer that showed up at several occasions throughout the year. Naturally, I decided I had to remix and switch things up and put a little spin on the classic cheese ball. I like to get creative with things once in a while and what better time than football season and the NFL opening game coming up? I’ve used ranch or blue cheese dressings when I’ve made cheese balls in the past. 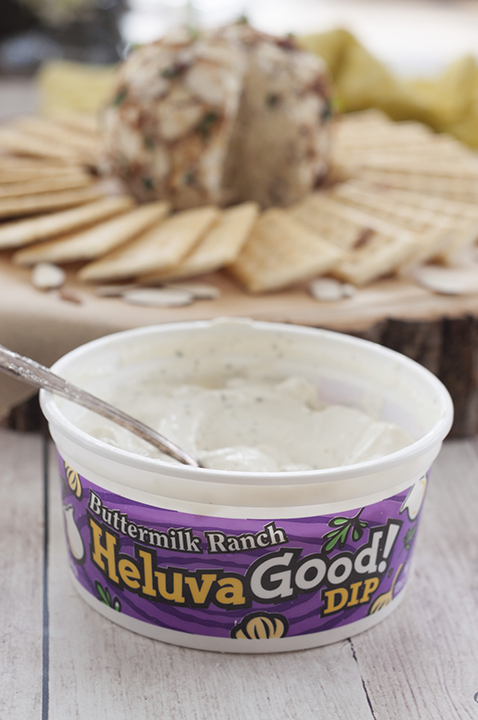 For this Buttermilk Ranch Bacon Cheese Ball, I decided to use Heluva Good! Buttermilk Ranch dip and couldn’t have been happier with the result. 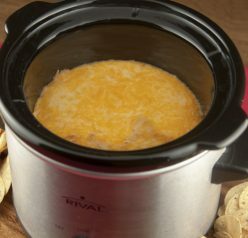 I started to think about all of the creative, different ways I could use their deliciously creamy dips in recipes. 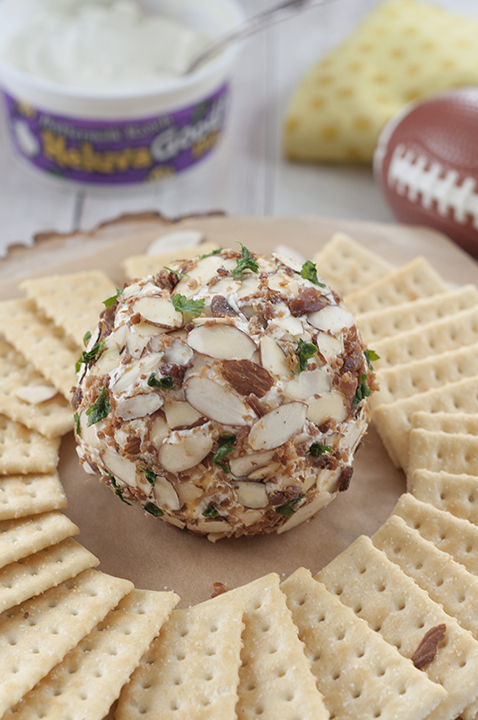 If you’re a cheese and dip lover, make this Buttermilk Ranch Bacon Cheese Ball for your next game day party, holiday party, cocktail party (ANY party, really) or, just because — and live happily ever after. Whether you’re hosting or simply attending a tailgate/homegate party or game day get-together, I bet nearly every one of us has faced some sort of party or potluck what the HECK do I bring to this thing? dilemma. Your problem is now solved. 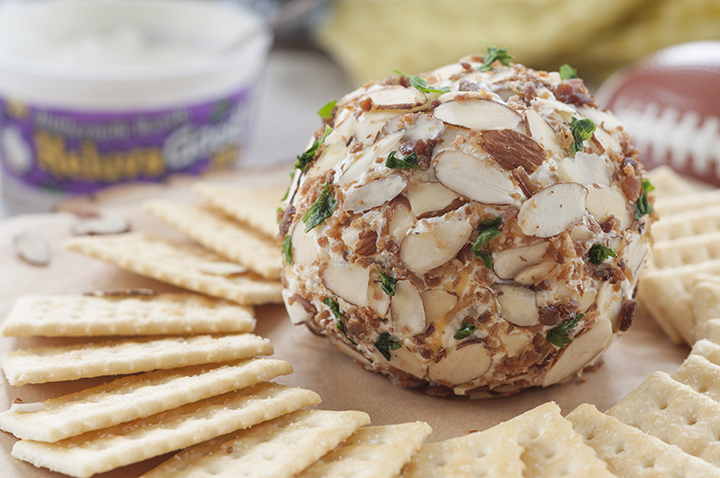 It might be the only cheeseball that I want to devour with a spoon… and only a spoon. EVER. I could eat this entire thing for my meal and not even be mad about it. In fact, I may have had a cheese ball for my dinner in the past. Feel free to use pecans or walnuts in place of the almonds! 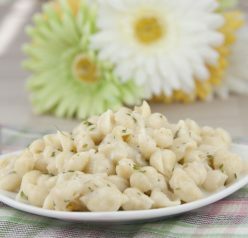 You can serve this right away but it’s best if you refrigerate it for a few hours or even overnight. This cheese ball will keep for several days in the refrigerator. 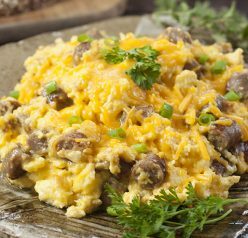 Make sure you serve it with your favorite buttery crackers or pretzels! You won’t want to eat anything else for the rest of the day. Trust me on that. I can’t wait to try this with the other six flavors of Heluva Good! dips (I’m thinking French Onion or Bacon Horseradish would be delicious!) 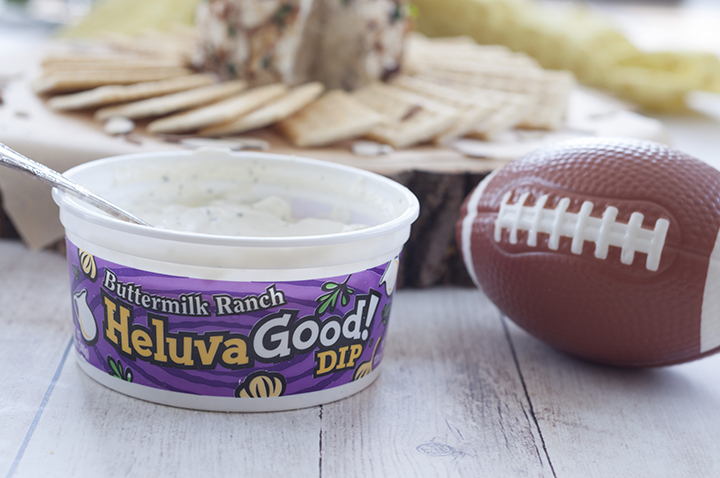 Finding their dips is easy: they can be found in the dairy aisle of the supermarket or just use this handy dandy product locator. If you’re super into cheese balls, make sure you check out my other amazing recipes for the perfect appetizer! 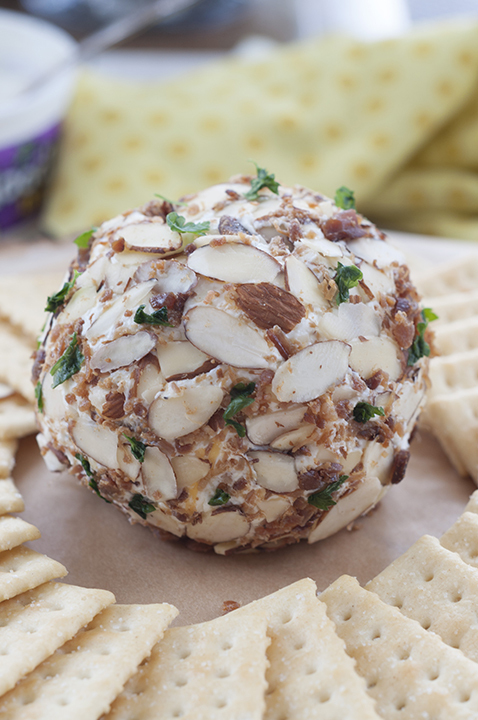 Buttermilk Ranch Bacon Cheese Ball loaded with cheese, bacon and coated with sliced almonds - a quick and easy appetizer recipe for any occasion ready in 10 minutes or less! In a large bowl, beat cream cheese until smooth. Stir in the 3 oz. of bacon bits, buttermilk ranch dip, cheese and garlic powder. Form it into a ball and wrap it up tightly. Refrigerate. 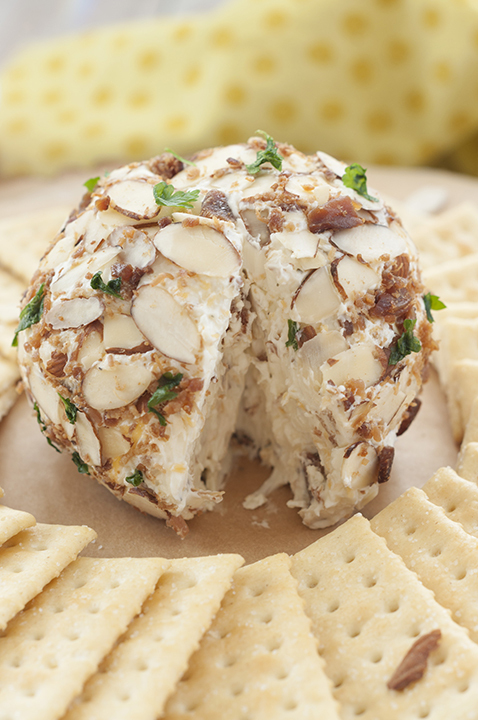 Just before serving, unwrap and roll cheese ball in slivered almonds and extra bacon bits. Sprinkle with fresh parsley for color (optional). Serve with your favorite crackers. Enjoy! Disclaimer: Thank you to Heluva Good! for sponsoring this conversation. All opinions remain 100% my own, as always. Thank you for allowing me to share the brands and products I use regularly and love. Such a great appetizer to serve as a part of cheese platters. Pinning this to try during the holidays. The perfect holiday appetizer and it can be made in advance! This is such a spectacular combo of flavors! So great for parties, and love the flavor combo! I love cheese balls! Bookmarking this to make for the next party. Thanks for sharing. This will get scooped up quickly at my house! This will be a sure hit at parties! Perfect for entertaining! Wow, this looks wonderful! Who doesn’t like bacon? Or a cheese ball? Put them together and you have a savory treat that can’t be beat! Thanks!